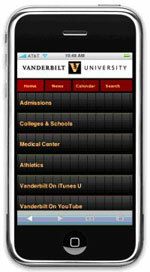 Vanderbilt University has released a version of its homepage designed for the Apple iPhone. The site was created by the Vanderbilt News Service's Office of Web Communications, which is working to optimize the university Web site for other mobile devices. "More and more of our students, faculty and staff are using the iPhone to access the Internet," Melanie Moran, assistant director of the Vanderbilt News Service, said. "We created a version of the Vanderbilt Web site that takes advantage of the iPhone's powerful software and intuitive Multi-Touch interface when using some of our most-visited content and applications, such as Webmail and online directory." The school said it is one of the first universities in the country to create an optimized version of its homepage for the iPhone. "The first place potential students look to learn more about a university is its Web site, and those students will increasingly be visiting on an iPhone," Moran said. "We targeted information for this audience to take full advantage of iPhone features, so potential applicants can get helpful and compelling information about our university wherever they are." The site provides audio and video from Vanderbilt's space in iTunes U, a dedicated area of the iTunes Store offering free educational content, as well as videos from the university's YouTube channel. University and athletics news can also be found on the site, which is updated automatically when the main Vanderbilt news sites are updated. Users can use the Web clip feature on iPhone to add the Vanderbilt symbol to their home screen by clicking the "+" sign at the bottom of their Safari browser while on the Vanderbilt site. Visitors can view the site either by going to www.vanderbilt.edu using a traditional Web browser or to www.vanderbilt.edu/iphone on an iPhone.